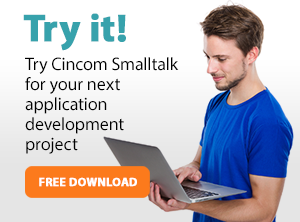 The Cincom Smalltalk product suite consists of the Cincom® ObjectStudio® and Cincom® VisualWorks® development platforms. ObjectStudio is an object-oriented application development/deployment platform for creating and maintaining business applications. VisualWorks is an enterprise-class, multilingual, cross- platform, application development and delivery platform that’s used by world- class companies in areas such as semiconductor manufacturing, shipping, financial risk management, insurance, banking, government, education and healthcare.